What started as a Bear oriented Expiry turned out to be an exception expiry for the Bulls with the 5300CE writers taken to the cleaners. The Bulls did the job when it mattered most to move Nifty from the dump at 5255 to the highs of 5342.80 to settle at 5315.05 a cool gain of 27.25 points and in the process captured the psychological level of 5300. Looking at the OI Table it’s just early days but an initial range of 5200-5600 is developing. 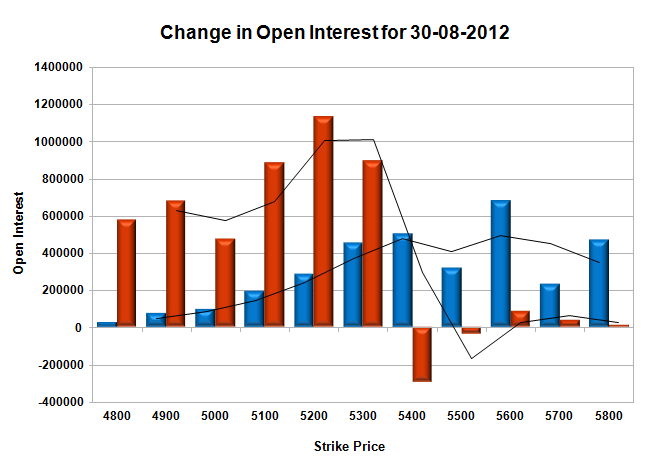 Call option 5100-5800 added 31.37 lacs huge amount of OI, with small addition seen at lower strike prices. Put Option 5300-4800 added 46.46 lacs huge amount of OI, with small liquidation seen at 5400 and above strike prices. Highest accumulation on Call option 5600 at 37.6 lacs & 5500 at 36.5 lacs whereas Put option 5200 at 56 lacs & 5300 at 45.8 lacs. Nifty Open Interest is at 2,04,94,000 up by 51,33,800 with increase in price, most probably huge long build-up. 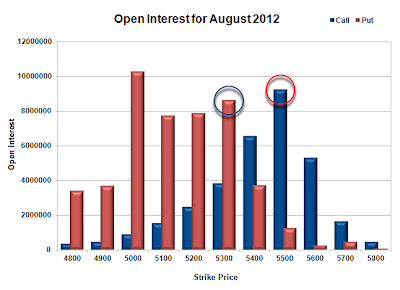 Bank Nifty Open Interest is at 15,28,225 up by 5,23,150 with increase in price, most probably huge long build-up. FII’s bought huge 17.57 lacs Futures, most probably long build-up, and their average price per contract comes to around 5259. FII’s future open contract as on date is 4.50 lacs. PCR Open Interest (Volume) at the start of the series is just above at 1.10. Initial developing support at 5300 and below that at 5200 with highest OI of 56 lacs. Initial resistance at 5400 with huge OI of 35.1 lacs and above that at 5500-5600 range. Range as per Option Table is 5262 -5354 and as per VIX is 5269 - 5361 with 5320 as the Pivot. Nifty had a trend day with open at the highs around 5345 and close near the lows of the day at 5287.80 a huge loss of 46.80 points. The day was dominated by the CE writers with huge addition at 5300 and 5400 levels, whereas the PE writers liquidated en-mass. 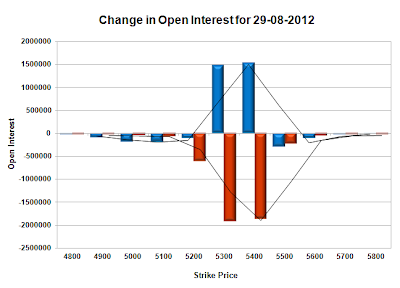 Tomorrow is expiry and looking at the OI table, the probable expiry will center around 5300 level. Call option 5300-5400 added 29.94 lacs huge amount of OI, with profit booking at 5500 and higher strike prices. Put Option 5200-5500 saw huge liquidation with no addition at any level. Highest accumulation on Call option 5400 at 1 Crore & 5500 at 88.4 lacs whereas Put option 5000 at 94.4 lacs & 5200 at 87.8 lacs. Nifty Open Interest is at 1,61,65,400 down by 41,00,750 whereas Sep series added 36.83 lacs OI with decrease in price, 90% were rolled over with some long liquidation. Bank Nifty Open Interest is at 10,70,525 down by 3,05,400 whereas Sep series added 2.67 lacs OI with decrease in price, 87% rolled over with some long liquidation. FII’s sold huge 1.02 lacs Futures, most probably long long liquidation, as their OI also decreased by 9.68 lacs, and their average price per contract comes to around 5074. FII’s future open contract as on date is 7.56 lacs. PCR Open Interest (Volume) is going down very fast and now at 1.449 due to huge liquidation seen at 5200-5500PE. 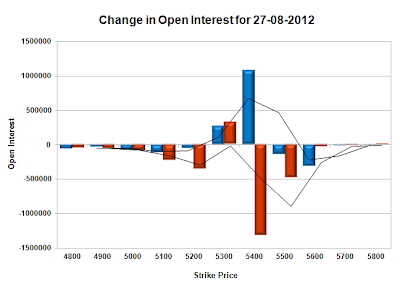 Support at 5200 with highest OI on PE of 87.8 lacs. Initial resistance at 5300 with huge addition of 14.7 lacs at 5300CE and above that at 5400 with highest OI in Option Table at 1 Crore. Range as per Option Table is 5257 -5348 and as per VIX is 5241 - 5334 with 5320 as the Pivot. Nifty opened flat, but it seemed that the Sellers are hell bent on selling from the word go, Nifty for the day touched the low around 5310 and closed at 5334.60 a loss of 15.65 points. The OI Table saw huge liquidation at 5300-5400PE levels. Call option 5300-5400 added 23.85 lacs huge amount of OI, with profit booking at 5500 and higher strike prices. Put Option 5200 added 10 lacs huge amount of OI, with huge liquidation seen at 5300 and above strike prices. Highest accumulation on Call option 5500 at 91.4 lacs & 5400 at 85.3 lacs whereas Put option 5300 at 95.8 lacs & 5200 at 94.1 lacs. Nifty Open Interest is at 2,02,66,150 down by 32,21,150 whereas Sep series added 56.14 lacs OI with decrease in price, 100% rolled over with some short addition in next series. Bank Nifty Open Interest is at 13,75,925 down by 3,43,675 whereas Sep series added 3.67 lacs OI with decrease in price, 100% rolled over with some short addition in next series..
FII’s bought huge 7.72 lacs Futures, most probably long build-up, as their OI also increased by 34.5 lacs, and their average price per contract comes to around 5113. FII’s future open contract as on date is 7.75 lacs. 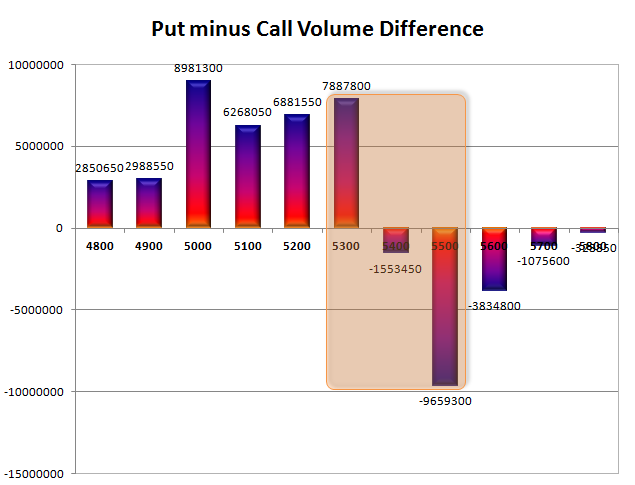 PCR Open Interest (Volume) is down at 1.696 due to huge liquidation seen at 5300-5400PE. Though 5300PE saw huge liquidation of 12.6 lacs but still it has the highest OI in Option Table. Resistance at 5400 with huge OI addition of 18.8 lacs and above that at 5500 with OI of above 91.4 kacs. 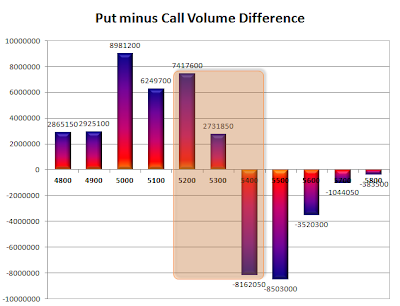 Range as per Option Table is 5287 -5386 and as per VIX is 5289 - 5380 with 5340 as the Pivot. 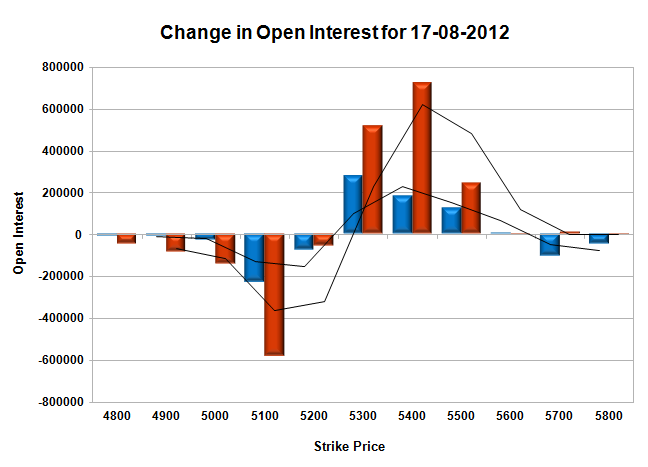 Nifty had a perfect trend day, with open at the highs and close at the lows with no intra buying seen at all. Weakness was seen throughout with Bank Nifty losing huge 1.77% though Nifty lost just 0.68% or 36.45 points to close the day at 5350.25. The OI Table saw good addition at 5400CE and huge liquidation at 5400PE. Call option 5300-5400 added 13.55 lacs huge amount of OI, with profit booking at 5500 and higher strike prices. Put Option 5300 added 3.28 lacs huge amount of OI, with huge liquidation seen at 5400 and above strike prices. Highest accumulation on Call option 5500 at 1.06 Cr & 5400 at 66.5 lacs whereas Put option 5300 at 1.08 Cr & 5000 at 96.9 lacs. Nifty Open Interest is at 2,34,87,300 down by 18,16,400 whereas Sep series added 25.85 lacs OI with decrease in price, probably long liquidation in present series and short addition in next series. Bank Nifty Open Interest is at 17,19,600 down by 85,400 whereas Sep series added 1.74 lacs OI with decrease in price, probably long liquidation in present series and short addition in next series..
FII’s bought huge 6.82 lacs Futures, most probably long build-up, as their OI also increased by 6.5 lacs, and their average price per contract comes to around 5100. FII’s future open contract as on date is 7.06 lacs. 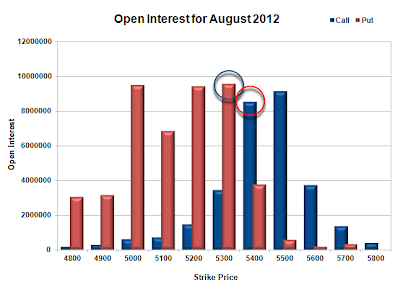 PCR Open Interest (Volume) is cooling down and now at 1.788 due to huge liquidation seen at 5400PE. The Big support is still around 5300 with OI at 1.08 Cr. New found resistance at 5400 with huge OI addition of 10.8 lacs and above that the Wall of Chine at 5500 with OI of above 1.06 Cr. Range as per Option Table is 5316 -5415 and as per VIX is 5304 - 5396 with 5365 as the Pivot. Nifty opened on a weak note and remained weak throughout the full session of trade unable to move above the psychological level of 5400 for once. The index saw a low of 5371 but ultimately close at 5386.70 a loss of 28.65 points, on a week on week on basis the index gained 20.40 or 0.38%. The OI Table saw huge liquidation at 5400PE and 5400CE with neither party sure about themselves. 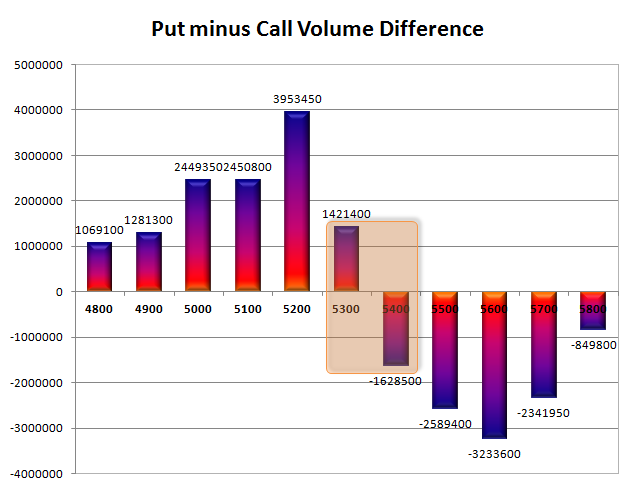 Call option 5500 added 4.33 lacs huge amount of OI, with huge liquidation seen at 5400 and lower strike prices. Put Option 5300-5100 added 10.1 lacs huge amount of OI, with huge liquidation seen at 5400 and above strike prices. Highest accumulation on Call option 5500 at 1.07 Cr & 5400 at 55.7 lacs whereas Put option 5300 at 1.05 Cr & 5000 at 97.8 lacs. Nifty Open Interest is at 2,53,03,700 down by 5,50,350 whereas Sep series added 5.58 lacs OI with small decrease in price, probably long liquidation in present series and short addition in next series. Bank Nifty Open Interest is at 18,05,000 down by 32,650 whereas Sep series added 31 thousand OI with decrease in price, probably long liquidation in present series and short addition in next series..
FII’s bought huge 2.77 lacs Futures, most probably long build-up, as their OI also increased by 4.27 lacs, and their average price per contract comes to around 5138. FII’s future open contract as on date is 6.93 lacs. PCR Open Interest (Volume) is still at 1.891 though huge liquidation was seen at 5400PE. 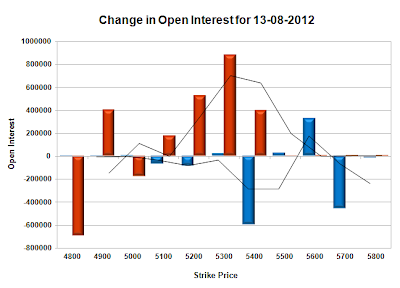 The Big support is around 5300 with OI of above 1.05 Cr. Super resistance which is getting better by the day is right now at 5500 with OI of above 1.07 Cr. 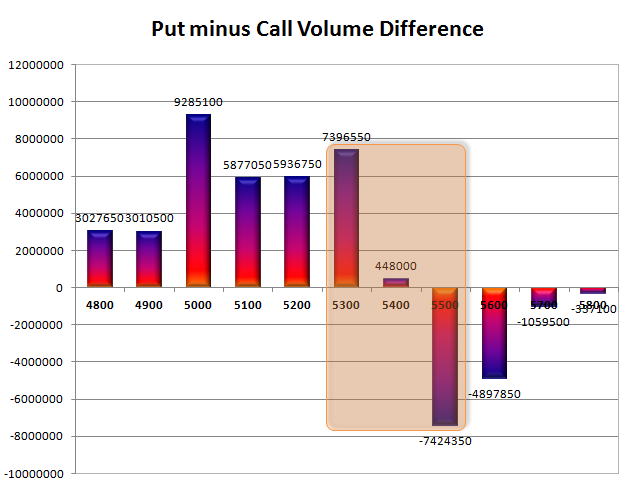 Range as per Option Table is 5341 -5432 and as per VIX is 5341 - 5432 with 5386 as the Pivot. Nifty opened positive on the back of good global cues and made a laboured move towards 5450, from where it was sold off to the day’s low around 5393. A small pullback towards the end saw the index close flat at 5415.35, a small gain of 2.50 points. The OI Table saw huge liquidation at 5500-5300PE levels.. 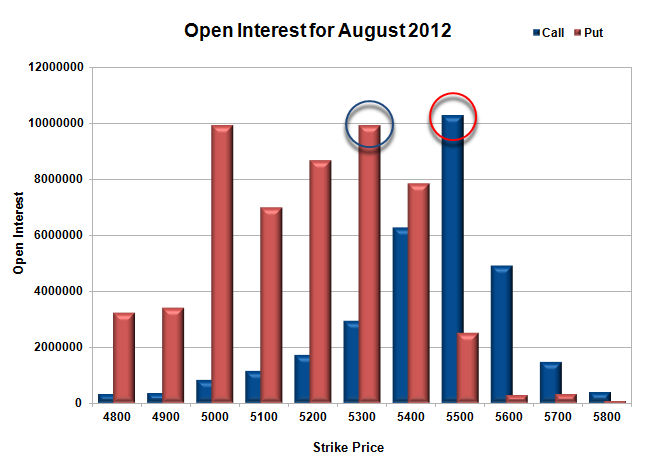 Call option 5500 added 2.62 lacs huge amount of OI, with huge liquidation seen at 5400 and lower strike prices. Put Option 5500-5300 saw huge liquidation, with profit booking seen at 5100 and lower strike prices. Highest accumulation on Call option 5500 at 1.03 Cr & 5400 at 62.8 lacs whereas Put option 5300 at 99.4 lacs & 5100 at 99.4 lacs. Nifty Open Interest is at 2,58,54,050 down by 2,76,200 with not much change in price, probably long liquidation. Bank Nifty Open Interest is at 18,37,650 down by 5,375 with small decrease in price, most probably small long liquidation. FII’s bought just 650 Futures, most probably long build-up, as their OI also increased by 9.95 lacs, and their average price per contract comes to around 5165. FII’s future open contract as on date is 6.85 lacs. PCR Open Interest (Volume) is still at 1.845. Initial support still at 5400 though some liquidation was seen but OI still at healthy 78.4 lacs below that at 5300 with OI above 99 lacs. 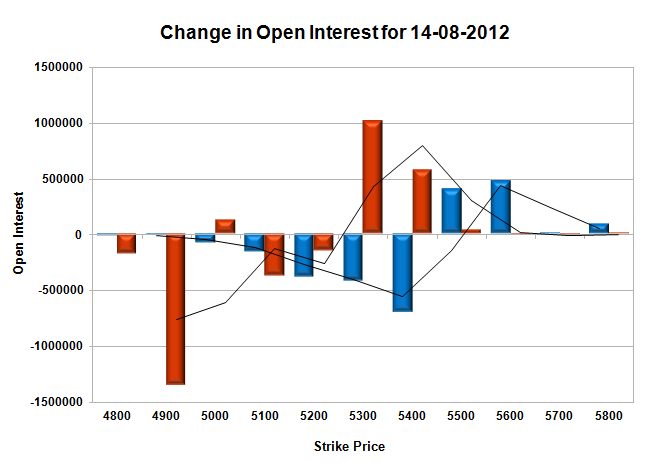 The only resistance which is getting better by the day is right now at 5500 with OI of 1.03 Cr. Range as per Option Table is 5373 -5465 and as per VIX is 5370 - 5461 with 5400 as the Pivot. Nifty opened weak just below the previous days close and remained below the dotted lines for the better part of the day. A strong pullback in the afternoon session saw the index make new high but was sold promptly to close the day weak at 5412.85, a small loss of 8.15 points. The OI Table saw huge addition at 5400PE and now OI is above 80 lacs for the same. Call option 5500 added 1.66 lacs huge amount of OI, with huge liquidation seen at 5300 and lower strike prices. Put Option 5500-5200 added 20.5 lacs huge amount of OI, with profit booking seen at 5000 and lower strike prices. Highest accumulation on Call option 5500 at 1 Cr & 5400 at 65.4 lacs whereas Put option 5300 at 1.07 Cr & 5100 at 99.4 lacs. Nifty Open Interest is at 2,61,30,250 down by 2,57,000 with decrease in price, probably some long liquidation. Bank Nifty Open Interest is at 18,43,025 down by 50,375 with small decrease in price, most probably huge long liquidation. FII’s bought huge 3.67 lacs of Futures, most probably short covering, as their OI also decreased by 1.98 lacs, and their average price per contract comes to around 5166. FII’s future open contract as on date is 6.65 lacs. 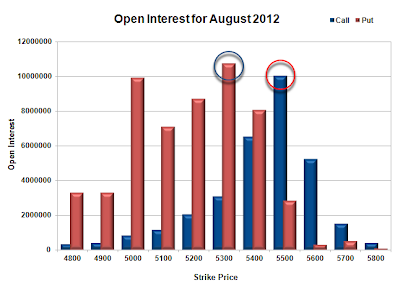 PCR Open Interest (Volume) is at all time high for the series at 1.847 due to huge addition at 5400PE. Initial support at 5400 with another huge addition for the day of 10.4 lacs and below that at 5300 with OI above 1.07 Cr. The one and only resistance right now is at 5500 with OI of 1 Cr. Range as per Option Table is 5368 -5460 and as per VIX is 5368 - 5458 with 5400 as the Pivot. Nifty opened above the dotted line and tried to move beyond 5400 but failed to do so in the morning session. A spurt around the last hour of trade saw Nifty conquer 5400 and closed comfortably above it at 5421.00, a huge gain of 54.70 points and in the process broke out of the 5400 top after around 5 months. Based on the OI Table, it looks totally tilted towards the Bulls with 5300 most probably not to be seen on closing basis this expiry. 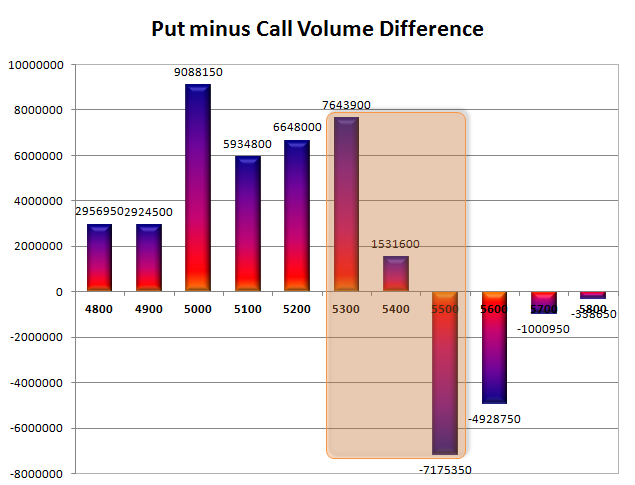 Call option 5500 added 4.91 lacs huge amount of OI, with huge liquidation seen at 5300 and lower strike prices. Put Option 5600-5200 added 54.9 lacs huge-huge amount of OI, with profit booking seen at 5100 and lower strike prices. Highest accumulation on Call option 5500 at 98.6 lacs & 5400 at 65.9 lacs whereas Put option 5300 at 1.07 Cr & 5100 at 1.02 Cr. Nifty Open Interest is at 2,63,87,250 up by 7,78,150 with increase in price, probably long build-up. 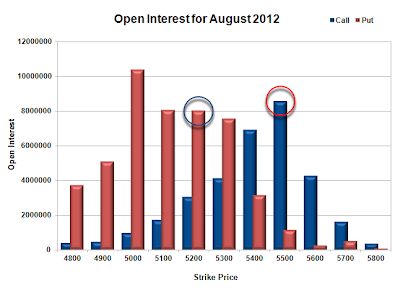 Bank Nifty Open Interest is at 17,93,400 down by 43,000 with increase in price, most probably huge short covering. FII’s bought huge 6.48 lacs of Futures, most probably long build-up, as their OI also increased by 6.09 lacs, and their average price per contract comes to around 5184. FII’s future open contract as on date is 6.69 lacs. PCR Open Interest (Volume) has jumped to 1.773 due to huge addition at 5300-5500PE. 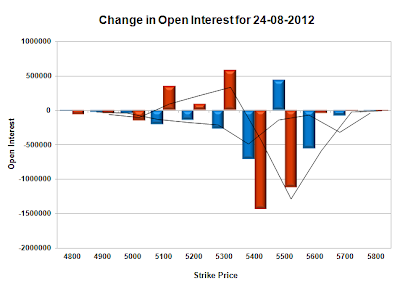 Initial support at 5400 with huge addition for the day of 25.6 lacs and unbreakable support at 5300 with OI above 1.07 Cr. 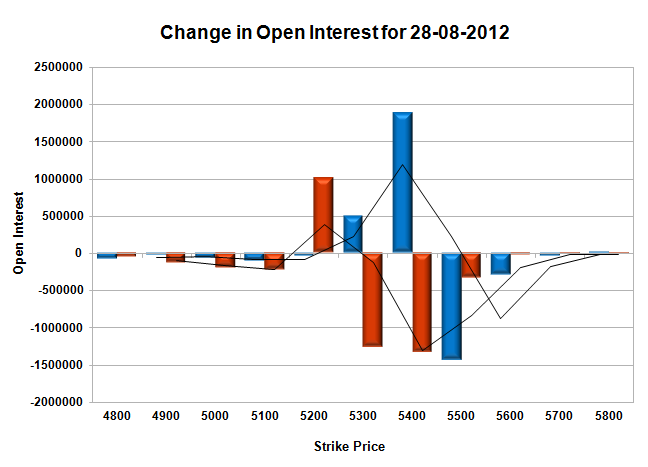 Only viable resistance right now is at 5500 with OI of just 98.6 lac. Range as per Option Table is 5353 -5462 and as per VIX is 5375 - 5467 with 5400 as the Pivot. SMR is a measure of fear in the market. A value of less than 15 indicates that market is lack of fear and volatility and the higher PCR ratio(greater than 1) supports such kind of action. And a value of 25 or greater than 25 indicates too much of fear in the market which is highly motivated with lower PCR ratio (less than 1). It is a kind of indicator which provides information about which kind of market we are right now. Nifty opened above the previous day’s close and moved higher to touch the top of the day at 5400, but a late sell off saw the index nose-diving towards 5340. A small pullback towards the end saw the index close flat at 5366.30, a negligible gain of 3.35 points and on a Week on Week basis it gained 45.90 points of 0.86%. Based on the OI Table it looks like a range of 5300-5450 with OI above 90 lacs at 5300PE and 5500CE level. 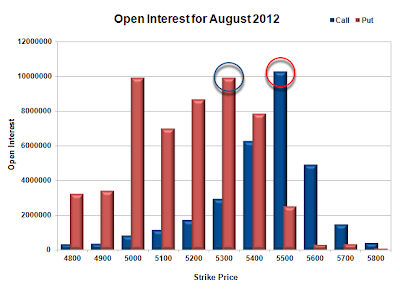 Call option 5300-5500 added 5.91 lacs huge amount of OI, with huge liquidation seen at 5100 and lower strike prices. Put Option 5500-5300 added 14.88 lacs huge amount of OI, with profit booking seen at 5100 and lower strike prices. Highest accumulation on Call option 5500 at 93.7 lacs & 5400 at 67.3 lacs whereas Put option 5000 at 1.01 Cr & 5300 at 91.5 lacs. Nifty Open Interest is at 2,56,09,100 down by 2,30,400 with no change in price, probably long liquidation/short covering. Bank Nifty Open Interest is at 19,36,400 down by 44,875 with decrease in price, most probably huge long liquidation. FII’s bought huge 6.44 lacs of Futures, most probably long build-up, as their OI also increased by 4.10 lacs, and their average price per contract comes to around 5152. FII’s future open contract as on date is 6.56 lacs. 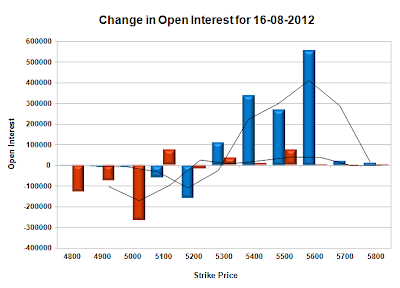 PCR Open Interest (Volume) increased to 1.578 due to huge addition at 5300-5500PE. Support at 5300 is rock solid with OI above 91.5 lacs, and below that at 5200-5000 level with huge OI at each strike price. Resistance is at 5400 with OI of just 67.3 lacs, but above that Wall of China at 5500 with OI of 93.7 lacs. 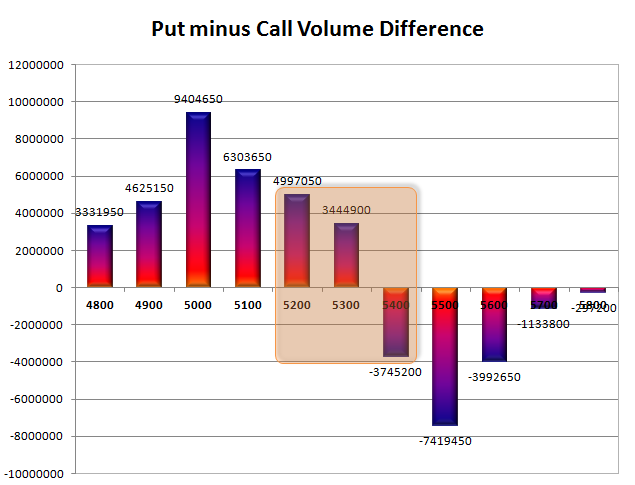 Range as per Option Table is 5324 -5414 and as per VIX is 5322 - 5410 with 5360 as the Pivot. Nifty opened flat and traded within a narrow range of 34 points for the full day and ultimately closed around the lows of the day at 5362.95, a small loss of 17.40 points. It was a day when neither the bull nor the bear we able to stamp their authority, but the Bears still made it sure that 5500 stays out of bounds for the Bulls. Huge addition was seen at 5400-5600 CE option. Call option 5300-5600 added 12.7 lacs huge amount of OI, with huge liquidation seen at 5200 and lower strike prices. 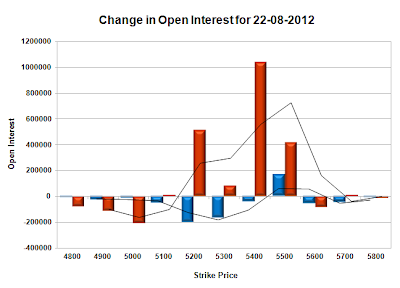 Put Option 5100 & 5300 added small amount of OI, with profit booking seen at 5000 and lower strike prices. Highest accumulation on Call option 5500 at 92.4 lacs & 5400 at 65.5 lacs whereas Put option 5000 at 1.03 Cr & 5300 at 86.3 lacs. Nifty Open Interest is at 2,58,39,500 down by 1,19,650 with decrease in price, most probably long liquidation. Bank Nifty Open Interest is at 19,81,275 down by 30,525 with decrease in price, most probably huge long liquidation. FII’s sold 25.05 thousand of Futures, most probably short build-up, as their OI also increased by 1.90 lacs, and their average price per contract comes to around 5169. FII’s future open contract as on date is 6.48 lacs. 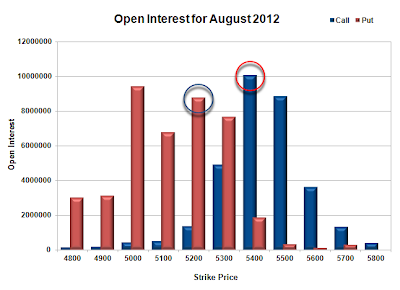 PCR Open Interest (Volume) is decrease a bit due to huge addition at 5300-5600CE levels and now at 1.569. Support at 5300 is still good enough with OI above 86.3 lacs, and below that at 5200-5000 level with huge OI at each strike price. Resistance is at 5400 but still not full-proof with OI of just 65.5 lacs, but above that Wall of China at 5500 with OI of 92.4 lacs. Range as per Option Table is 5323 -5414 and as per VIX is 5319 - 5407 with 5360 as the Pivot. Nifty opened flat and kept moving in a narrow range waiting for the Inflation data which came in around 12 Noon much better than expected at 6.87, whereas the consensus was around 7.25. The participant took it as the ticket to some softening by RBI governor in the coming policy and moved the index vertically up by about 50 points from the lows. Good addition was seen in Nifty with OI now around 2.6 Cr and the Option Table also saw huge addition at 5300PE Level with OI now above 86 lacs.. 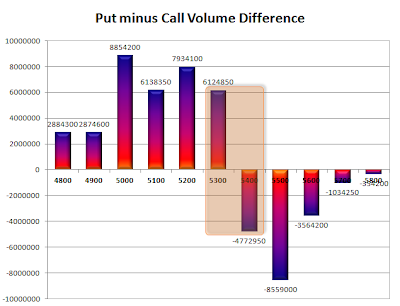 Call option 5500-5800 added 9.95 lacs huge amount of OI, with huge liquidation seen at 5400 and lower strike prices. Put Option 5400-5300 added 16.01 lacs huge amount of OI, with profit booking seen at 5200 and lower strike prices. Highest accumulation on Call option 5500 at 89.7 lacs & 5400 at 62.1 lacs whereas Put option 5000 at 1.05 Cr & 5300 at 86 lacs. Nifty Open Interest is at 2,59,59,150 up by 6,65,800 with increase in price, most probably huge long build-up. Bank Nifty Open Interest is at 20,11,800 down by 61,425 with increase in price, most probably huge short covering. FII’s bought huge 5.42 lacs of Futures, most probably long build-up, as their OI also increased by 3.78 lacs, and their average price per contract comes to around 5193. FII’s future open contract as on date is 6.44 lacs. PCR Open Interest (Volume) is increasing by the day and now at 1.626 due to huge addition at 5300PE level. Support at 5300 now looks un-breakable with OI above 85.9 lacs, and below that at 5200-5000 level with huge OI at each strike price. 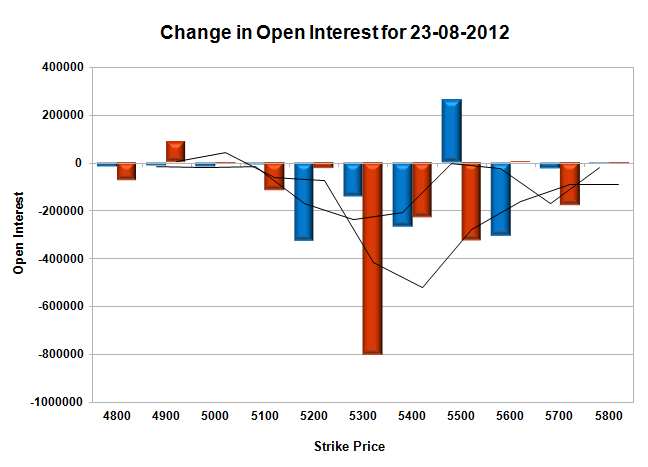 Resistance is still at 5400 but looks vulnerable, with huge liquidation, and above that at 5500 with OI of 89.7 lacs. Range as per Option Table is 5323 -5416 and as per VIX is 5336 - 5424 with 5360 as the Pivot. Nifty opened flat and oscillated in a very narrow range of 20 points keeping the previous day’s close as pivot, and when it looked like it will end the day flat, it broke out and made a dash towards the high of the day at 5350. The index ultimately closed at 5347.90 a small gain of 27.50 points. India VIX is at the low of the series at 16.01 with ATR getting narrower with each passing day. The OI Table looks bullish and Nifty is feasting on all the nay sayers, who still don’t believe in this rally. 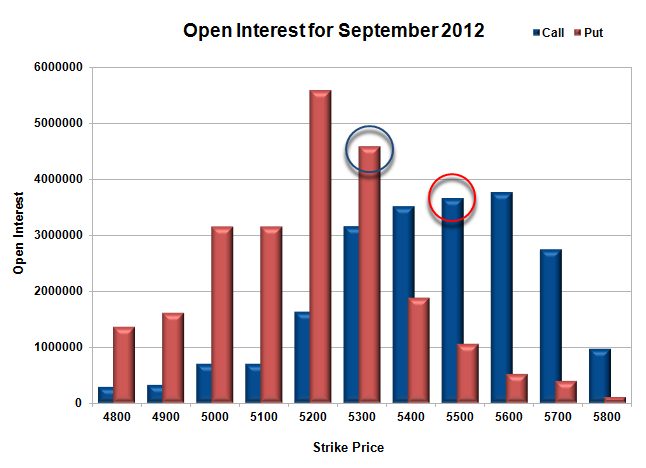 Call option 5500-5600 added 3.59 lacs huge amount of OI, with huge liquidation seen at 5400 and lower strike prices. Put Option 5400-5100 added 19.8 lacs huge amount of OI, with profit booking seen at 4800 and lower strike prices. 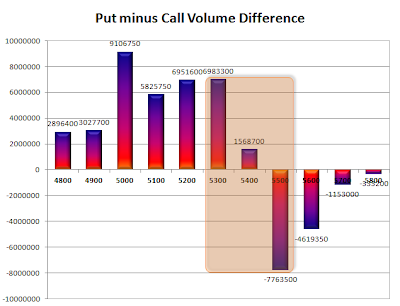 Highest accumulation on Call option 5500 at 85.7 lacs & 5400 at 69.1 lacs whereas Put option 5000 at 1.04 Cr & 5100 at 80.5 lacs. 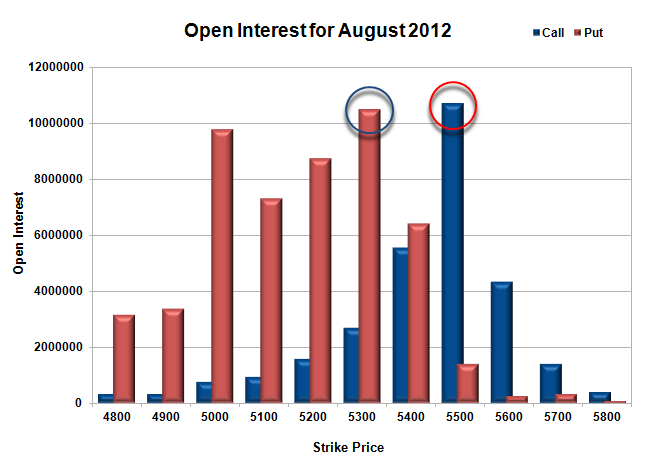 Nifty Open Interest is at 2,52,93,350 up by 9,55,650 with increase in price, most probably huge long build-up. 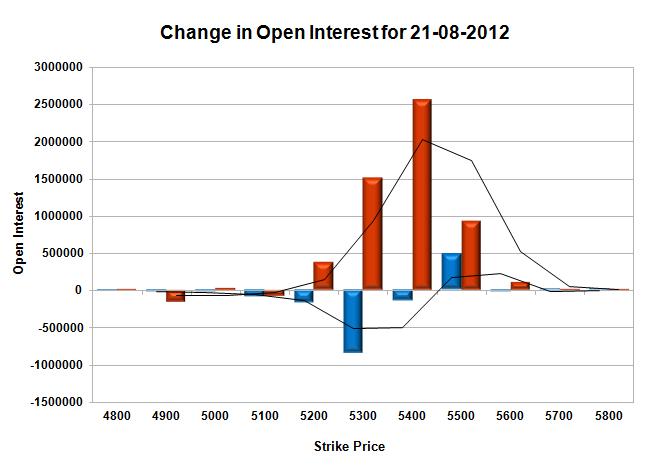 Bank Nifty Open Interest is at 20,73,225 down by 19,550 with increase in price, most probably small short covering. FII’s sold small 52.5 thousand of Futures, most probably short build-up, as their OI also increased by 11.03 lacs, and their average price per contract comes to around 5154. FII’s future open contract as on date is 6.37 lacs. PCR Open Interest (Volume) has jumped to 1.612 due to huge addition at 5300PE level. Support at 5300 has been strengthened with huge addition of 8.8 lacs for the day, and below that at 5200PE with OI of above 80 lacs. Resistance is still at 5400 with net OI above 69 lacs and above that at 5500 with OI of 85.6 lacs. Range as per Option Table is 5293 -5386 and as per VIX is 5303 - 5393 with 5340 as the Pivot.